Many important issues about the biosynthesis and export pathways of the mycolate-containing compounds remain unresolved. How mycobacteria control and modulate the content and the fine structure of their mycolic acids (MAs)? What are the compositions and structures of the metabolic systems responsible for the production and degradation of MAs and MA-containing compounds? How this metabolism responds to environmental conditions and what regulatory mechanisms are involved? Elucidating these open questions is of paramount importance for understanding the intricate network of events governing the host–pathogen dialogue involving the MAs; they constitute the main aim of this topic. MA biosynthesis. MAs are the products of a mixed fatty acid synthase/polyketide synthase biosynthesis pathway. The formation of the main extra long 'meromycolic' chain of MAs is dependent upon an original Fatty Acid Synthase type II (FAS-II) elongation multienzyme system. Another enzymatic machinery, the mycolic condensation system, catalyzes the ultimate stage of this pathway. With collaborators, we develop integrative approaches to decipher the compositions, precise functions and structures of these unique protein complexes. We study the enzymatic properties of their individual subunits specific to very long acyl chains and the structural bases of their unprecedented functions. We also investigate their roles in the physiology of mycobacteria and in the virulence of M. tuberculosis. Thanks to this approach, we contribute with others to draw a more comprehensive scheme of this key mycobacterial metabolic pathway. 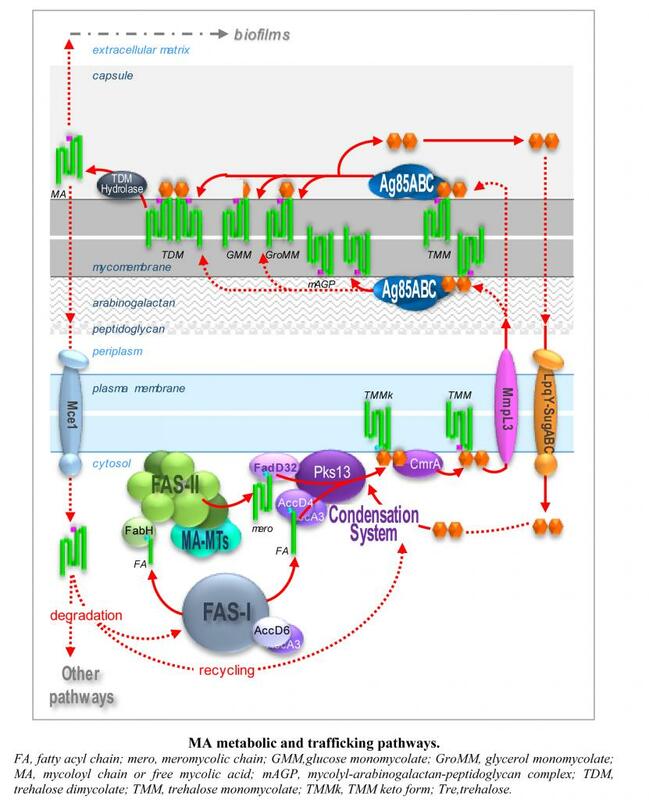 Regulatory mechanisms of mycolic acid metabolism. It is known that genes involved in MA biosynthesis in M. tuberculosis are downregulated in the macrophage infection model, and several transcription regulators of this pathway, FasR, MabR and FadR, have been identified. Accordingly, our group recently observed that nutrient scarcity, encountered during infection, leads to downregulation of the hadABC genes encoding FAS-II dehydratases along with most of the genes required for the synthesis and transport of mycolates. This adaptation phenomenon partly relies on the bacterial stringent response. Post-translational modifications and notably signaling through Ser/Thr phosphorylation have also recently emerged as a key regulatory mechanism in pathogenic mycobacteria. In particular, we demonstrated with others that the activities of important or essential enzymes of MA biosynthesis and transport pathways are negatively regulated by serine/threonine protein kinases (STPK).